release for those who want to try. BETA parallel to your existing and working installation for now. the AV window and post it here, as any other comments, too. there. All previous RTL1090 settings will be kept. This is a beta version of RTL1090. Functionality is experimental and partially incomplete yet. Please use at your own risk. Retain the release that is working for you as a copy. the top bar or the frequency indicator. cope with the USB data rate (32 MBit/s). – Avg. Signal Strength (SG) and Message count (MSGS) added to flight table. Avg. Signal Strength is normalized to 100% (max 99%). red (you can touch it). however command line entries are still valid and do override any selections. checked, so the override conditions will not be saved to the configuration file. caption bar – no further functions yet – if you see the sign go back tohttp://rtl1090.jetvision.de and download the next release. Well I downloaded it and fired it up and can report a much improved performance, with the promise of even more to come from the sound of it, just not sure my ageing PC is going to keep up! My video detailing the construction of my collinear has also been featured on rtl-sdr.com and has now received quite a few views and I can report it is still performing magnificently. I posted earlier in the month about using the inexpensive RTL-SDR dongles with some free software to create a virtual radar system. I mentioned about how I had built an inexpensive collinear antenna out of coax to improve my reception, both in range and message rate. Anyway here is the video, I hope it encourages people to have a go. 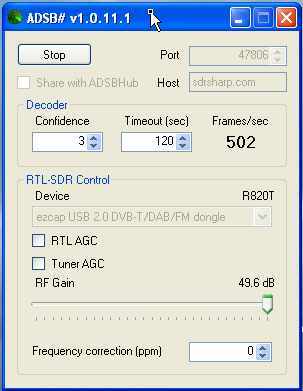 I currently own three RTL2832 based DAB/DVB-T USB dongles. Whilst they are exceptional value and using them as SDR dongles is a brilliant piece of hacking I just haven’t had really utilised them since I have my FUNCube Dongles, both the HF capable PRO+ and the older PRO version. One big plus point of the RTL-SDR devices is the the ability to sample wideband signals, theoretically over 2MHz this offers tantalising opportunities for software based decoding of signals. One such wideband signal is the ADS-B messages broadcast by most commercial aircraft. As I posted once before one of the most interesting and therefore popular things to monitor on traditional radio scanners are air-band transmissions. 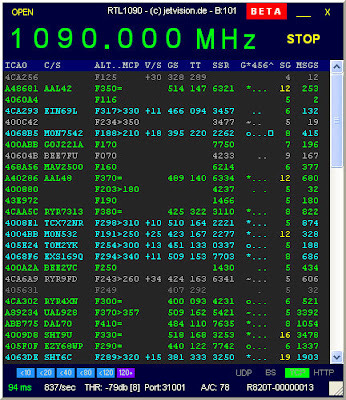 Listening to aircraft communicating with air-traffic control can be quite addictive, especially if you are able to hear transmissions from the tower of a busy airport. Several years ago the dreams for would be air-traffic controllers were fulfilled with the introduction of virtual radar systems. 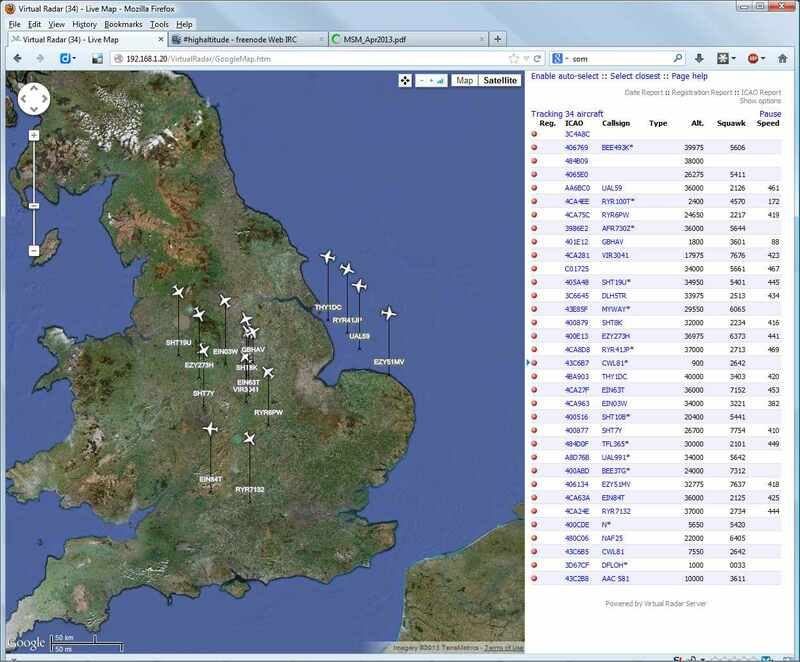 These units monitored these ADS-B messages using a dedicated receiver connected to a computer which could then display aircraft position and information on a screen just like the real thing, as well as your own ‘spots’ you could join networks of others receivers to have complete coverage of any area you wanted in real time. 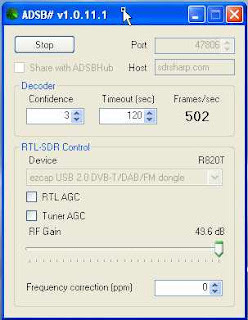 At the end of last year I found just such an alternative on the Ham Radio Science blog using the humble RTL-SDR dongles. 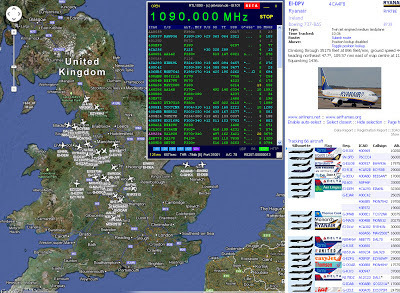 The RTL1090 ADS-B Decoder for Windows from Jetvision is simplicity itself, it is free and assuming you have the Zadig drivers for the dongle then it is a small step to run the program and verify if you are receiving the ADS-B broadcasts, the decoder can be made to emulate a ‘BEAST’ ADS-B receiver so can be networked to Plane Plotter (non-free) or Virtual Radar Server (free) to display air traffic information. 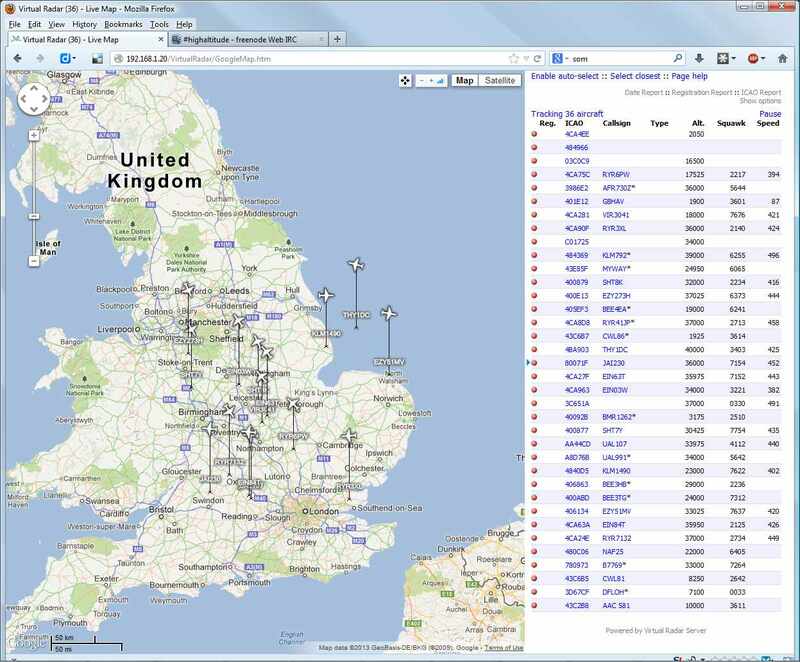 Since then other ADS-B decoders have become available including ADSB# from the people who brought you SDR# and this can be linked to other programs like ADSBScope. There is lots of information out there for those interested just use Google. Like I said I briefly toyed with this at the end of last year as a nice diversion at a difficult time but I was frustrated by the range of reception I was achieving, some of this is due to the RTL-SDR dongles being a little deaf but mainly not having the right antenna, sparked by a thread I read on the Transmission1 forum and the cost of some of the antennas I investigated the idea of making my own and got the decoding bug again. I originally tried to construct one out of some spare RG-58, by cutting and soldering it, but it proved frustrating and fiddly. I opted for the technique described in the original plans using the RG6 coax with a solid central core, by cutting it with a Stanley knife and pushing the sections together (checking as I went along for shorts with a meter) and then taping them in little over an hour I had a 16-section antenna which I put inside a white plastic tube which I bunged up and taped for weather proofing. Connected up a F-plug to the small section of coax I had coming out and I was ready to go! I currently have the ‘white stick’ plugged into one of the dongles containing the Rafael Micro R820T tuner. It is just propped up against the window in the ‘computer room’ just a few feet away from two computers one of which is an old Linux server clocked around 1GHz, along with a wireless router, printer, cable modem, phone charger etc. So not an ideal position for interference but having downloaded the latest version of RTL1090 and ADSB# I have been impressed by the performance of the antenna compared to the wideband discone in the loft. In RTL1090 there is a display showing the received packet rate, i.e the number of messages decoded. With the discone I was getting just two bars out of 6, with the ‘white stick’ I am getting almost a continuous 4 and occasionally 5. 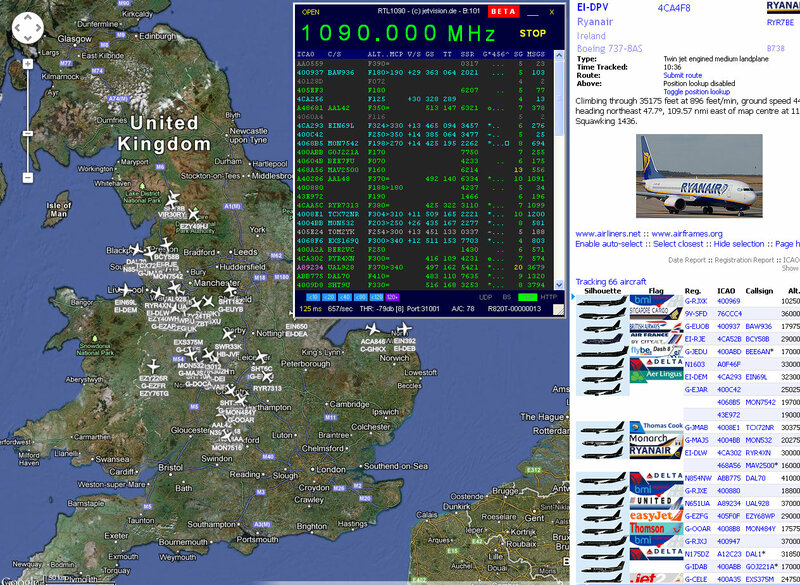 On Virtual Radar Server I am getting at lot further range, all I need to do now is get the stick up high to see what it capable of, I really must get on with my planned antenna mast! In ADSB# I have also got a decent data rate, interestingly I get a better data rate if I switch off the AGC controls, which the opposite of the RTL1090 program..